Are you driven by professional challenges? We’d like to get to know you! 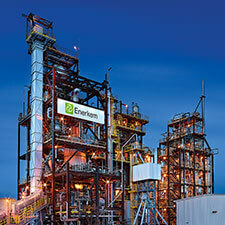 Enerkem’s hallmarks are innovation, excellence and passion. How about you? Our team is made up of high-level professionals who are engaged, creative and energized by professional challenges. The technology we use to produce our biofuels and renewable chemicals from non-recyclable waste material is revolutionary. We are proud to be part of an exceptional entrepreneurial venture with tremendous potential for international growth. Currently in full expansion mode, our young company is constantly seeking new talent in support of its development. If you want to join an energized team, apply for one of our openings today. Recruitment fraud can take many forms including email, text, phone call, social media, or website job posting. Often an individual or group will claim to represent Enerkem and will approach job seekers with the prospect of employment. The intention of the fraud is to build trust and then ask potential victims to pay fees or provide personal information. Enerkem is committed to an ethical and fair recruitment process. We take these attempts to defraud the public very seriously. If you believe you have been approached as part of a fraudulent recruitment process, we advise you to contact your local police authority and provide them with all relevant information.